Compost Farming Hestel Tellus: Dr. Elaine Ingham versus the Beccari Cells. Dr. Elaine Ingham versus the Beccari Cells. 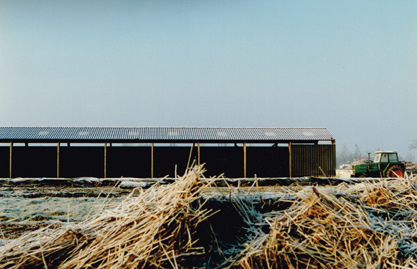 Tellus Natuurkompost BV - Netherlands - winter 1991. "Dr. Elaine Ingham Ph. D. is a world-renowned soil biologist who pioneered many of the currently used biological soil amendment techniques and pioneered the testing of soil microbial life as an indicator of soil and plant health. Dr. Ingham is the Chief Scientist at the Rodale Institute. She is the founder of the Sustainable Studies Institute and the Soil Foodweb Inc. soil testing labs. Dr. Ingham is the key author of the U.S. Dept. of Agriculture's Soil Biology Primer. She has been the mentor of numerous soil scientists and practitioners of ecologically balanced landscape design, and has helped farmers all over the world to grow more resilient crops by understanding and improving their soil life." Ingham: "Depending on the bedrock, it is a mixture of sand, silk, clay... Almost all soils contain all the minerals that you need to grow plants... You need organic matter to convert these minerals into a form that plants can take up, to be able to grow. You need life. For this life you need the organisms in the organic matter. If your soil does not have the organic matter and when it does not have the organisms your soil is dirt. Then you lack the biology and you lack the food to feed those organisms." When Ingham talks about agriculture she explains what happened over time referring to the friction between soil life and the consequences of the common agricultural wields of today. When she talks about agricultural habits in the past she talks about tilting and harvesting. Here she mentions something remarkable about the use of organic materials. She says: "You blow of your organic matter, every time you tilt... The organic matter went dawn on the surface of the ground, where the bacteria had a big party... There they blow off 60% of your organic matter in CO2.... 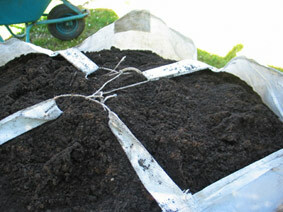 When you do not compost those organic materials you are asking for salt and disease problems... Finally the virility of that soil is gone." So far we go along with the point of view of dr. Elaine Ingham. Very true and interesting indeed. But when she talks about compost and composting, we think she is missing the point completely. About rebuilding soil Ingham says: "You need to take the organic materials and compost it... grow up all the micro organisms that you need in the soil to do proper nutrients cycling. To build soil structure. To hold on for your water for you. To suppress diseases and insect pests... So we have to make compost." Wow, so far so good. But then she asks us: 'What is compost?' And she gives the answer: 'Compost is by definition The Oxidative Decomposition of a Mix of Organic Matter. Oxidative means with oxygen. If there is not oxygen, if there is not air, then it is not compost. It has gone be something else.' Now we start to doubt her. On WikiPedia Oxidatie. we find: "Oxidation is a chemical process in which one substance emits electrons to another substance... In the past it used to be defined as an oxidation reaction with oxygen. Examples are rust and combustion reactions... Therefore the process derives its name from the word Oxygenium, the Latin name for oxygen. In oxidation, even oxygen, however, needs not always to be involved." Which means that for oxidation oxygen is not always needed! And, it is not a bacterial process. On Google books we find an other definition of compost: 'The Science of Composting, Part 1', By Eliot Epstein, in his introduction on page 1, he defines: "The biological decomposition of organic matter under controlled, aerobic conditions into a humus-like stable product." In our post 'Rich in oxygen and oxygen poor.' we explain the full meaning of oxygen in this process. 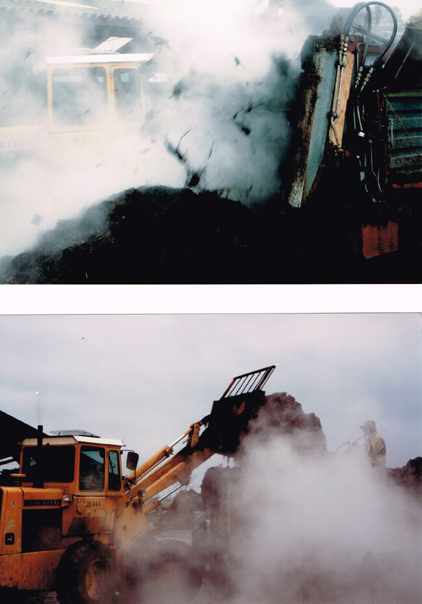 The only thing we like to remark here is that compost is not like 'a stable-product', or manure as we understand it. It is a precondition for soil activity. Further more Ingham explains why 'we all need oxygen'. She stresses: "You will die after 3 minutes, when you lack oxygen. Bacteria will die in 20 minutes and you will lose all of the beneficial organisms. They cannot breath and cannot stay alive... or go dormant. 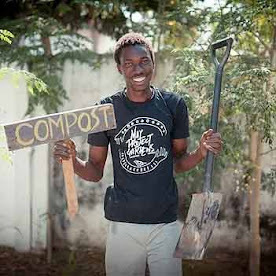 So, you need monitoring your compost pile and make sure that is stays aerobic." Then she explains the rise of temperature and the need of turning the compost pile over and over again, until the temperature drops. Then she considers the compost ready for use. She assumes that only the bacteria (the termophillic microbes) that have used a lot of oxygen, are useful for the soil... With there dead bodies, to be clear... For they are already dead when the compost is ready... Otherwise it would not be compost. But we also need the mesophillic and the thermotrophic bacteria (on lower temperatures) to make a good compost. So, here she is horribly inconsistent. The worst thing is that when her point of view is monitored, this will represent a major contribution to the CO2 emissions into the environment. Inghams arguments lack any logic when it comes to composting. And that is a shame. But as a renowned microbiologist of the soil she is a relief. She says very clear things about the impact of the current, so called modern, farming techniques. She gives relevant suggestions to restore the topsoil. And her explanations are welcomely plausible. With the termophillic microbes... and CO2 emissions, we have had our experiences. The method of the Italian Prof. Beccari. In the year 1922. Professor G. Beccari patents his 'Apparatus for working garbage and refuse of towns'. "These cells where build with stone and concrete with a content of 20 m3. They had a false floor with a grid, to allow an air ingress and to drain the descending water, at the same time... Initially there was experimented with Beccari cells, which showed that not the abundant air supply was the decisive factor for the success of the conversions, but substantially a certain moisture content of the mass. A quantity of 100-120 liters water per m3 of city grime gave the best results." And... this is what we see when we are composting grasses and herbs. The quantity of grafting fluid in the materials is responsible for the success of our composting, not the abundant air supply. With all this air the materials dry out. Note that the composting of grasses is far more difficult then the composting of city grime in the years 1920-1950. Grasses are much less accessible. That we developed a copy of the Beccari Cells (intuitively) is not a coincidence. It came from our daily practice, from trial and error. We did all things wrong and did our best to make it all right. Practice showed that the Beccari Cells are correct. It is always a surprise to see how some things from 1922 and today can come together. Or is it not a surprise, but pure logic? 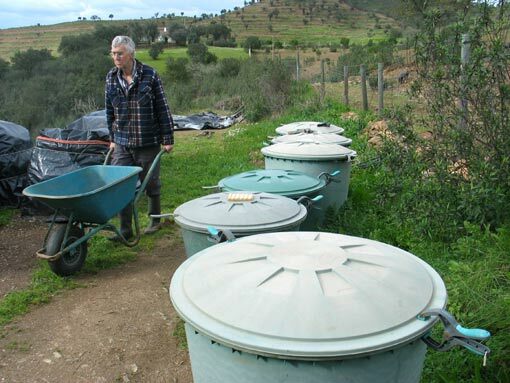 The use of barrels and big bags... the same principle as the Beccari Cells. - The book 'Bodem-bacteriologie in dienst van de land-en tuinbouw' by dr. ir. F.C. Gerretsen, published in 1939, page 138, about an experiment with the Beccari Cells in the Netherlands. - Google books, 'The Science of Composting, Part 1', By Eliot Epstein, December 1996, pages 1, 4 and 17.